Beyerdynamic's new Byrd headphones promises personalised sound quality | What Hi-Fi? Beyerdynamic has announced a revamp to its brand and a new Byrd in-ear headphone range. Beyerdynamic has added to the avalanche of new products at IFA 2018, launching six new products, offering wired and wireless earphones and personalised sound. Beyerdynamic Byrd is the new range of affordable in-ear headphones, with wired and wireless models promising the "flattest design and biggest sound". The Byrd in-ears follow in the footsteps of the What Hi-Fi? Award-winning Byron range of earphones, so we are expecting big things when it comes to sound quality and overall performance. The wired earphones, the Beat Byrd and Soul Byrd, are joined by the Blue Byrd and Blue Byrd ANC wireless earbuds. 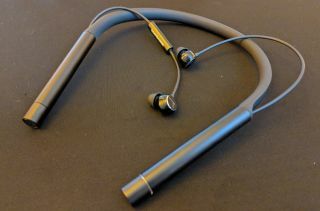 The wireless models aren't "true wireless" but instead sport a flexible cable (Blue Byrd) or neckband (Blue Byrd ANC) joining the buds, while the Blue Byrd ANC adds, you might have guessed, active-noise-cancelling. Both of the Blue Byrd wireless headphone models come with "Mosayc sound personalization", which aims to tune the sound to your ears after running a hearing test via the company's MIY app (available on Android and iOS). This tech was first launched with the Aventho Wireless (£400) headphones and has been developed with Mimi Hearing Technologies in Berlin. The Blue Byrd earphones support AAC, aptX Bluetooth and aptX low latency, plus six hours of wireless battery life and charging via USB C. There's a three-button in-line remote for Android and iOS on the Blue Byrd, Blue Byrd ANC and Soul Byrd headphones. All the new in-ears promise a flat design and a flexible cable. The Beyerdynamic Beat Byrd will launch in September for 24.90 euros, the Soul Byrd will follow in October for 79 euros, the wireless Blue Byrd is due in Q4 costing 129 euros, and the Blue Byrd ANC will cost 249 euros. Don't fancy in-ears, then there are the Lagoon ANC over-ears, which also feature active noise-cancelling and sound personalisation.